The Akron Zoo is thrilled to announce the birth on March 24, 2010 of two capybara babies. 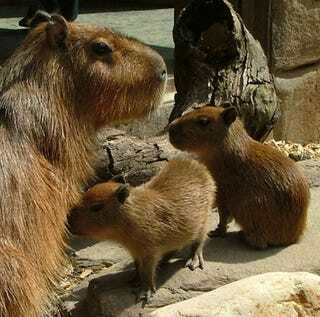 Mother capy', Courtney, and the two babies are now on exhibit in the Zoo's Legends of the Wild. The capybaras will be on exhibit daily as long as the temperature is above 65 degrees and conditions are favorable. The capybara's scientific name hydrochaeris is Greek for "Water Hog" and they live up to it!